VTA wheelchair lifts, ramps, and device spaces on buses are maintained at the standards established by the Americans with Disabilities Act (ADA). .
VTA customers with Mobility devices that fit on, can be supported by a lift or ramp, and can be maneuvered in and on the bus or light rail train, are welcomed aboard VTA buses and light rail trains. If a mobility device is too large to fully enter the bus or light rail train, is blocking an aisle, or would interfere with the safe evacuation of passengers in an emergency, the customer can be denied service. Customers without mobility devices may also use bus lifts and ramps upon request. VTA Coach Operators are required to provide a lift or ramp to anyone who requests this assistance. Passengers who encounter a bus with a lift that is not working should wait for the next bus. If the wait for the next bus is longer than 30 minutes, the driver will request a special lift-equipped van to provide transport. 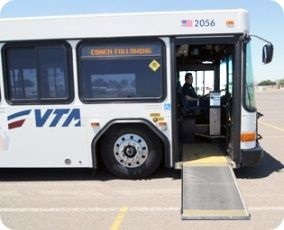 VTA’s new low floor buses have ramps for direct wheelchair boarding. When an elevator is out-of-service, audio and message text announcements will be broadcast aboard Light Rail vehicles, at light rail stations, and on VTA’s website giving the location of the out-of-service elevator. Passengers who must deboard a train at a station with an out-of-service elevator should let the train’s operator know. The train operator will take steps to deboard you at another station and provide alternative transportation, if needed, to your desired station.